Student protestors gathered in front of the library on Wednesday afternoon to smoke in opposition to alleged university investment. A cloud of smoke rested in front of the USF library on Wednesday afternoon. 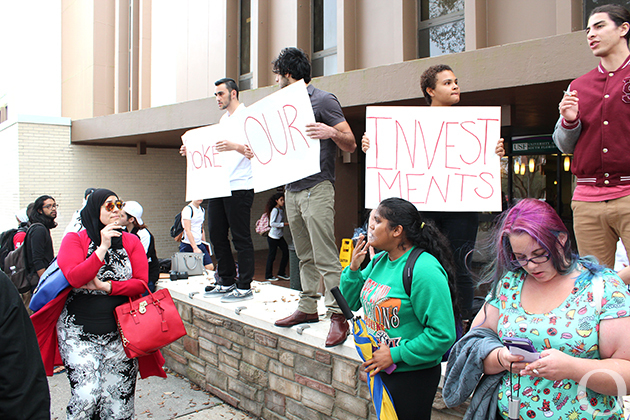 The protest was part of an effort to raise awareness about alleged USF investment in Philip Morris International, British American Tobacco, Japan Tobacco and Imperial Tobacco, according to protestors. By purchasing tobacco products and using them on campus, according to Rahma Elmohd, a junior majoring in English, the protestors are sarcastically promoting university investment in tobacco, an investment she disagrees with. The investment in tobacco companies was not the only investment addressed in the flyers given out to passing students. “We don’t just invest in tobacco companies,” the flyer stated. “We invest in fossil fuel companies, such as coal and oil companies. We invest in private prisons that profit from the mass incarceration of Black Americans. Student Government Senator in the College of Medicine Muhammad Imam said the investment information was gained from tracing stock tickers present in financial records from the USF Foundation. However, these records could not be located. “We found it ironic that our university cites fiduciary responsibility and then invests in a product which they ban on campus,” Hussam said. The goal, according to the flyer, is socially responsible investment policies. Imam said it’s harder to lead by example and easier to tell people what to do. “What we’re asking for is not unique,” Imam said. A University Police (UP) squad car stationed in front of the library did not intervene. At one point, the car turned on its lights and drove away. Another UP officer walked by the protest. She stared for several seconds before continuing into the library. UP Captain Meg Ross could not be reached for comment by time of print. The smoking ban is peer enforced, but Freeman said students protesting by smoking could be subject to disciplinary action. Some students were under the impression that the protest was against the smoking ban USF implemented in January. “It’s more about the investments than the cigarettes for sure,” Vince Gyongyosi, a freshman in biomedical sciences, said. The cigarettes were, however, a good way to get people to come out, in his opinion. He wanted to take a stand against the investments. Gyongyosi doesn’t think it’s right that he is paying to go to a school that doesn’t support what he supports. For the university to impose a smoking ban yet invest in big tobacco isn’t something he thinks adds up. Some students did complain but ultimately the protest did not face any significant challenge. Zein Barakat, a senior majoring in biomedical sciences, said the protest was not in support of smoking.